RVCCArts IS PART OF ONE BOOK! RVCC has announced its 2017 One Book and associated activities and we are proud to say that Bend, by Kimi Maeda has been included. This year's One Book, When the Emperor Was Divine by Julie Otsuka, is a novel based on the WWII internment camp experiences of the author's family. On a sunny day in Berkeley, California, in 1942, a woman sees a sign in a post office window, returns to her house, and matter-of-factly begins to pack her family’s possessions. Like thousands of other Japanese Americans they have been reclassified, virtually overnight, as enemy aliens and are about to be uprooted from their homes and sent to a dusty internment camp in the Utah desert. In this lean and devastatingly evocative first novel, Julie Otsuka tells the story of one Japanese American family from five flawlessly realized points of view—the mother receiving the order to evacuate; the daughter on the long train ride to the camp; the son in the desert encampment; the family’s return to their home; and the bitter release of the father after almost four years in captivity. When the Emperor Was Divine is a work of enormous power that makes a shameful episode of our history as immediate as today’s headlines. Other activities, including Bend, will examine, from varying points of view, the subjects of the war and Executive Order 9066, which interned thousands of Japanese-Americans in the western half of the U.S. for the duration. One Book at RVCC has been made possible, in part, by TD Bank. For a current schedule of activities, go to the One Book web page. For further information on Bend, go here. Bend ticket holders and purchasers are invited to pick up a copy of When the Emperor Was Divine at the theatre box office, starting March 20. Box office hours are 11-4, weekdays. Don't Miss These Other Great One Book Activities! Award-winning documentary by Emiko Omori. A visually stunning and emotionally compelling documentary/memoir about the events, meaning and lingering effects of the World War II internment on the Japanese American community. 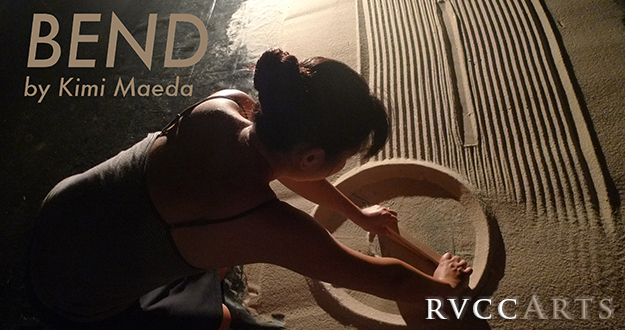 Bend tells the true story of two men interned in a Japanese American internment camp during World War II: Maeda's father, an Asian Art historian who suffered from dementia at the end of his life, and the subject of his research, the renowned artist Isamu Noguchi. Using shadow and projection, theatre artist Kimi Maeda retells the story of her father and Noguchi, both of whom were incarcerated in a camp in Poston, Arizona. Referencing the landscape of the camp's desert, she uses sand to create live highly detailed drawings inspired by these images. Both compelling and moving, this intimate visual performance examines the effects of losing one's home, one's cultural identity and one's memory, and poses important questions about how the Japanese American internment camps will be remembered.